The new QuickCheck 5600 handheld computer will transform the way you look at engine data. It has faster processing speeds, greater memory and a long battery life, plus the capability to change individual engine parameter settings without using a PC. The QuickCheck 5600 is now available for purchase. Register the PowerSpec application (pre-loaded) and begin adjusting individual parameter settings in the Electronic Control Module (ECM) using only the handheld unit. Users can quickly and easily adjust the maximum road speed and idle shutdown parameters to match regulations that vary from region to region. Technicians can “tweak” a fleet-wide parameter setting to meet the specific needs of an individual route or driver, and it can all be done without having to upload and download data from a PC. QuickCheck 5600 comes with QuickCheck CE and PowerSpec CE applications pre-installed. QuickCheck CE allows you to monitor a range of data from any manufacturer’s engine with electronic controls for transmission, braking and vehicle systems. PowerSpec CE reads trip and fault code information from Cummins on-highway engines. It contains many key functions of the full PowerSpec program, allowing users to read feature settings, perform direct engine edits and transfer hot specs all in the palm of their hands. The QuickCheck 5600 uses simple push-button and touch screen navigation with minimal commands. Its 4" VGA color TFT LCD screen is easier to read in all lighting conditions. The long-lasting rechargeable lithium-ion battery provides up to 14 hours of usage and can be recharged using the supplied USB cable, AC power supply/recharger or the vehicle service connector. The battery pack is removable for quick exchange or recharging. The rugged, portable and user-friendly QuickCheck 5600 is fully compatible with any electronic engine. 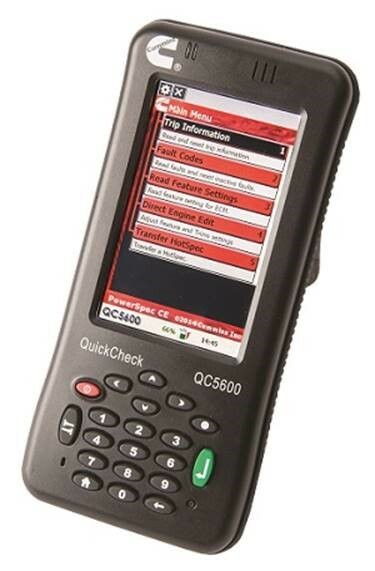 Powered by the Windows CE operating system, the QuickCheck 5600 features an integrated data link adapter, which connects to your engine via J1587 or J1939 industry-standard data links and is compatible with 250 and 500 kbps data link speeds, for rapid, trouble-free data capture. No separate adapter is required.